Damodar Kunda (lake) is very famous for Hindu religion. 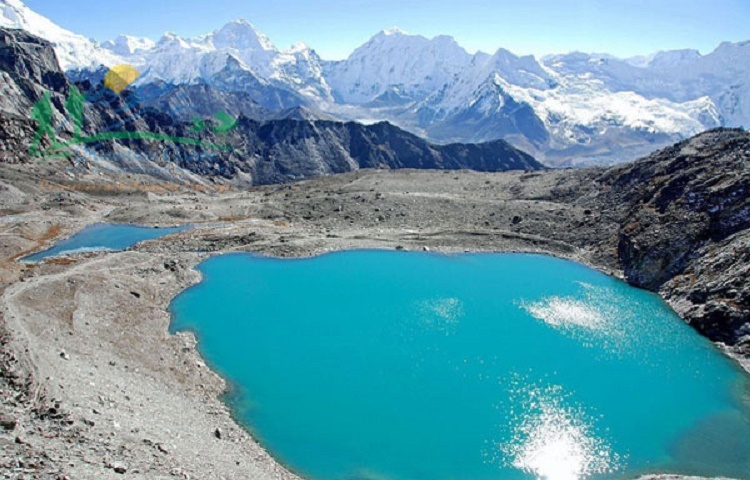 This Lake is situated high up in a rain shadow area of the Himalayas north of the famous Annapurna range of the upper Mustang region between Kagbeni and Muktinath. The elevation of the Damodar Kunda is 5400 meters. The place is cold windy but as beautiful as you wonder. From Damodar Kund, the views are spectacular, a bit higher than the lakes, just a short climb up some of the hills. From here you can see the Tibetan plateau & Damodar Himal to the north and the massive Annapurna Himalayas to the south. The place is popular for Lord Bishnu Chakra and shaligrams(the god stones). The place is the starting of Kali Gandaki River too. There are 65 peaks in this Himal range including Damodar Himal, Muktinath Himal (6,706m), and Bhrikuti Peak (6,364m). It is three days walk North- east of the main Mustang trekking route & very close to the Tibetan border. Usually this area is open for visitors from April to September, but the best time to visit this area is during the full moon of August every year, when you can enjoy a big festival. Many Hindu and Buddhist pilgrims will also be there to celebrate the full moon. While visiting Damodar Kund you’re in the land of Mustang, the hidden kingdom of Himalayas, you will enjoy a very different culture then that of Indian sub continent. 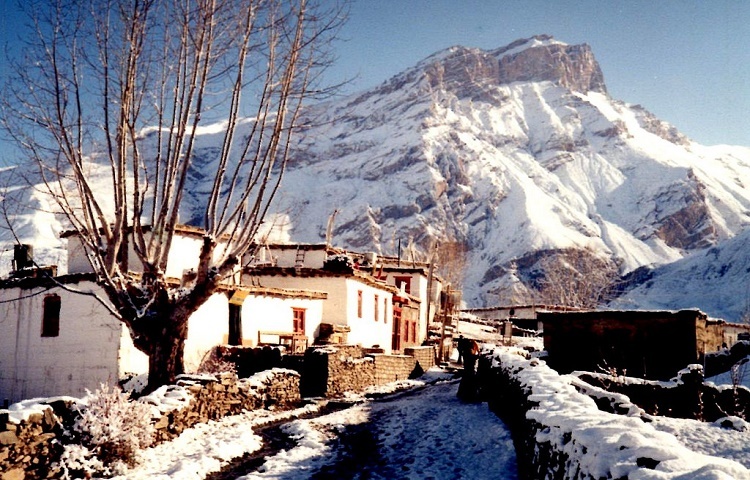 Muktinath is Sanskrit name, itself has religious overtone and a sort of emotional ring to it for the devout Hindus. This words separation two word Mukti & Nath. Mukti mean Salvation and Nath mean god and Nirvana. So it holds great significance for all spiritual people in the south Asian sub continent. Muktinath (the provider of salvation) has been one such holy site, where thousands of devotees flock for attaining the much sought after moksha( freedom) from the cycle of birth and rebirth. It is an ardent wish or a dream if you may say, of every Hindu to get Mukti-Nirvana from this cycle taking births over and over again. It is belief of the Hindus that this world is “MAYA” (an illusion) and the earliest one gets out of it the better and a visit to Muktinath will help them achieve that goal. Since then it called Muktinath. It is believed that one must visit this temple after completing pilgrimage of four special religious sites, Chardham Yatra of India; Muktinath must be visited once. The famous Muktinath is a sacred & important pilgrimage place both for Hindus and Buddhists. It located in Muktinath Valley lies in the district of Mustang and is situated about 18 kms. Northeast of Jomsom in the north central part of Nepal. At an altitude of about 3800 meters at the foot of the Thorong La mountain pass (part of the Himalayas). The holy shrine at Muktinath is in a grove of trees and includes a Buddhist Gompa. And the pagoda style temple of Vishnu Mandir,is close to the village Ranipauwa. Which sometimes mistakenly is called Muktinath as well. After having early morning breakfast we will take you to the airport then you’ll fly to Muktinath by helicopter. You’ll land to Ranipauwa (3710m). After you land you’ll have a short hike for upto 30 minutes to the Muktinath temple. Muktinath is god of Salvation; it holds great significance for all spiritual people in the south Asian subcontinent. Muktinath (the provider of salvation) has been one such holy site, where thousands of devotees congregate for achieving the much sought after moksha i.e removing the bad sins of life by having holy bath on 108 waterspouts, name of “Muktidhara”. Holy bath in Kunda (2 Kunda in front of Temple) also remove the bad sins of peoples. Hindu devotees take bath under chilled water of 108 waterspouts “Muktidhara” & Laxmi & Saraswati Kunda. It is believed that it brings them salvation. Having darshan and worship to Muktinath and then the god walk to Jwalamai Temple is the major attraction of the tour. After worshipping Muktinath you’ll then hike back to Ranippauwa then you’ll charter to Damodar Kunda. Damodar Kunda(5400m) is the lake that is very famous for the Hindu and Buddhist pilgrims. The place is very cold and windy place but very beautiful. This Lake is situated high up in a rain shadow area of the Himalayas north of the famous Annapurna range of the upper Mustang region between Kagbeni and Muktinath. From here you can see the Tibetan plateau & Damodar Himal to the north and the massive Annapurna Himalayas to the south. There are 65 peaks in this Himal range including Damodar Himal, Muktinath Himal (6,706m), and Bhrikuti Peak (6,364m). It is three days walk North- east of the main Mustang trekking route & very close to the Tibetan border. The place is the starting point of the Kali Gandaki River. The starting point of the biggest Kali gandaki starts from this very starting destination. Lord Krishna has said that who pays a visit to this Kunda and takes a deep-bath, they will be freed from all the sin. It is also mentioned in Puran that two sons of Kubers were suffering from their wrong doing & sin, which they did in their previous birth but lord Krishna suggested them to take bath in this Kunda and immediately after taking bath in this Kunda they were released from all their sin. So the importance of a visit to this sacred place cannot be described in a short paragraph. The place is very famous for the Shaligrams, Chakra of holy god Vishnu. We can find the shaligrams i.e the stones crafted by the gods i.e by their avatars. It is believed that the shaligram worshipping is the very important for the devotees as worshipping it is as important as visiting the sacred areas to worship.